Eating a Philly Cheesesteak in Philadelphia was on our Love Foodie Bucket List. (I prefer to call my list Mason Jar List as I hate the words Bucket List.) Mr Sweetie could hardly wait until we ate at Pat's King of Steaks and Geno's Steaks while we were in Philly. He is really not a "bucket list" kind of guy but I have always known that getting to these Philly Cheesesteak destinations is like a pilgrimage to him. I, on the other hand, knew that those two Travel Channel favorites are not all that great. When we asked our Hop On/Hop Off tour guide about the closest stop to Pat's and Geno's, she looked as if she was going into an Anaphylactic shock. Ha! Ha! She pretty much told us to not waste our time except only if we wanted to go for "historical reasons." We asked her for a recommendation on the best Philly Cheesesteak and she recommended "Sonny's Famous Steaks". Located just minutes from the Liberty Bell and Independence Hall, we went after visiting the Benjamin Franklin Museum. After a day of touring Philly's historical sights, we were ready for some big delicious meal. "We’re regularly recognized as one of the best cheesesteaks in Philadelphia! GQ Magazine’s food critic Alan Richman taste-tested all the big-name cheesesteak shops only to proclaim Sonny’s, “The best cheesesteak in town!” U.S. News & World Report featured Sonny’s in, “The 5 Best Cheesesteak Shops in Philadelphia.” Locally, The Inquirer places us on their list of top cheesesteaks. We’ve been discussed and praised in Forbes. 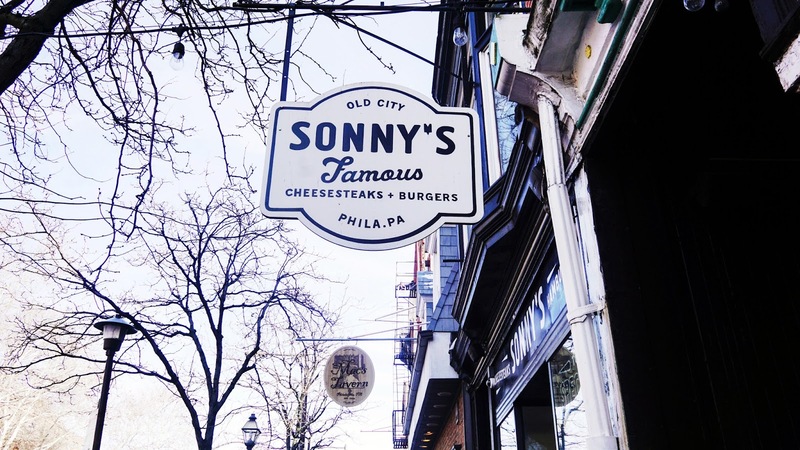 Foodies will appreciate Sonny’s appearance in blogs such as Serious Eats and Eater." The shop is no-frills, casual and small. We both ordered the Cheesesteak Hoagie (with Cheezwhiz for me -- because gotta have Cheezwhiz in your cheesesteak when in Philly!). The verdict? 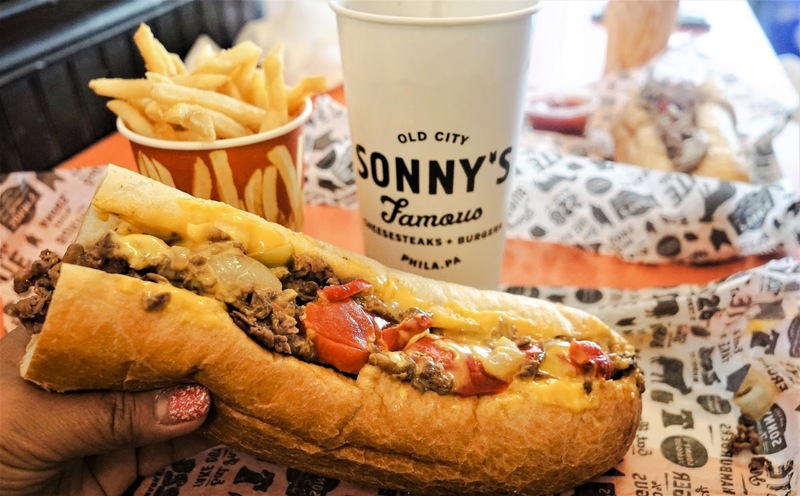 During our trip to Philadelphia, we tried three Philly Cheesesteak eateries -- Sonny's, Pat's and Geno's. (Yup, we still went!) 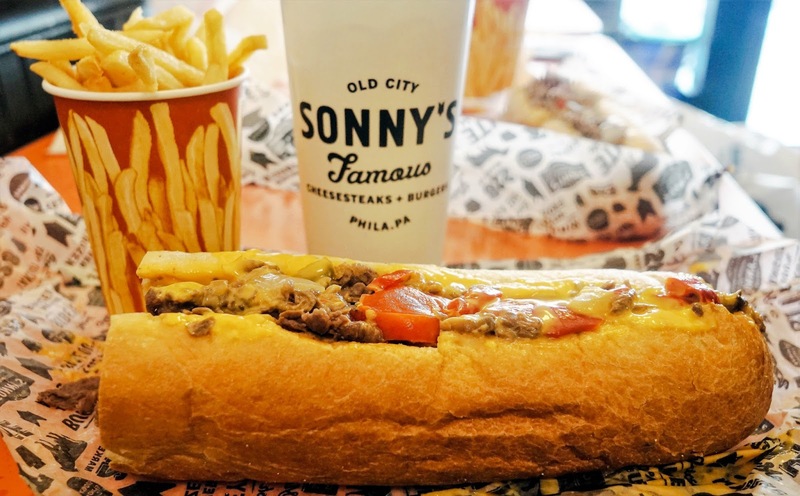 Sonny's ranks as Top 1 on our list, and we used Sonny's to gauge the level of yummyness of the cheesesteak sammies that we tried while in Philly. Sonny's was the best! Our tour guide even got us lost on our way to Sonny's (which turned out to be a beautiful afternoon of wanderlust), but it was so worth it. I wish that we have Sonny's in the Bay Area. The hefty sandwich was packed with flavorful, moist and tender steaks. It was truly delicious. And unlike in the Bay Area, the $14 per person with gigantic sandwich with fries and drinks was a bargain. Our final tab was just $28 before tip!